We come from bedrock. Iodine for our teeth, fingernails of zinc, cobalt to coat our tingling nerves and beating heart, all built from the rocks and stones beneath our feet. The enzymes needed for our immune systems to function optimally rely on a full complement of trace elements such as molybdenum or selenium. This is one of the differences between food as fuel and food as medicine. We achieve deep nutrition by eating food rich in minerals, grown in soils full of biology. Yet we have become accustomed to the ‘new normal’ of poor soils, demineralized food and consequent ill health. Our land, our crops and ourselves have an ‘inner hunger’ on a physiological level born out of incomplete mineral nutrition, as described by Bob Cannard in his excellent podcast. He urges us to strive for the ‘physical completeness and tranquility that can arise from the freedom of internal hungers’. To do this we must look to natural processes and try to mimic the epic journey of soil bedrock through to biologically available minerals. Take a spade and scrape off the leaf layer of a healthy soil and you may see a rich dark layer of detritus and fibrous roots. You are looking at duff, the layer of soil rammed full of microbial activity twixt plant and soil – this is Gods compost. Dig deeper into the dark brown layer past root hairs and sweet smelling aerobic soil. It’s a peaty smell with mushroomy undertones. Deeper still and you hit a paler, cooler wetter world. Here amongst the tap roots and earthworms are streaks of yellow and blue. Dig deeper and in a good deep soil we are waist deep in the earth and the smell is of iron. We may think of our mortality. And finally the spade jars in our hand. We have hit bedrock. And here in the dark wet secret places live microbes evolved to anaerobic ferment! This is where geology becomes biology, as bacteria slowly digest the minerals in the bedrock through the dance of life, reproduction and death. They are digested again and again passing through generations of amoeba and protozoa, on up the soil food web until they are fully biologically available as building blocks to make fingernails, teeth and a heartbeat. Why is it so important to have a full range of minerals biologically available in the soil? Liebig, the German chemist conceived of an interesting phenomenon called ‘Liebig’s barrel’. The idea was simple. A barrel made of staves of differing lengths would only fill with water to the height of the lowest stave. He saw soil fertility similarly – out of the full range of minerals needed for perfect growth the mineral lacking the most would limit all other mineral uptake by the plant. A lack of just one mineral therefore has profound consequences. In practice most of our soils are lacking in minerals and we are accustomed to rates of photosynthesis that are throttled back to idle, or tickover at best. Our approach to soil fertility, particularly in the field of organics or permaculture suffers two main misconceptions. The first is that we should concentrate on building soil organic matter, through compost or other organic additions. As growers, we sometimes concentrate on this to the exclusion of all else. Eve Balfour, one of the founders of the modern organic movement stated that the way to plant health was through healthy soils and therefore we should feed the soil not the plant. John Kempf, on the other hand states that if we can get plants photosynthesising at full efficiency through the balancing of minerals and soil biology, the sugars and lipids exuded through the plant roots will feed the soil. In other words in order to build healthy soil we must ensure healthy plants! Fear not - we are not advocating that you trash your compost heap. Dressing the soil with compost is a fantastic way of building soil productivity and structure. But we also have to check that we have the full potential of minerals available to the plant as well. It is this that unlocks the incredible benefit that healthy plants have on soil. Plant leaves grow shiny as the excess lipids formed through optimum photosynthesis form on the leaf surface and are then expelled through the root hairs and stored in the soil. 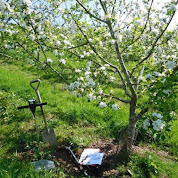 It is this laying down of fat by healthy plants that contributes greatly to the formation of stable hydro-carbon chains in the soil, the sort of soil carbon that climatologists talk about. made good compost at Ragmans it would put most things right in our soils and we left it at that. However, most commercial growers test their soil regularly for good reason. If they find mineral deficiencies they buy in chemical salts of the major mineral nutrients beyond NPK, such as magnesium sulphate or calcium carbonate to balance their soils. Minerals in the form of salts are conventionally applied to the land in this way. However a foliar and soil application of biofertiliser containing predigested minerals makes the mineral directly available to the plant, as well as the soil. In this way we can either apply a broad spectrum of minerals through the use of rock dust, or if we are growing at scale we can test for specific deficiencies and introduce salts into the biofertiliser as it brews. These predigested minerals will be more available to the plant which means we can apply far smaller amounts with greater success and less waste. Biofertiliser is a critically important tool in the kit, enabling farmers and growers of any scale to produce high quality biological fertilizer that combines the power of a balanced soil biology to build the soil food web, with the full array of trace elements and soil minerals. It can be produced on the kitchen table or at scale and applied from a hand sprayer or helicopter. Think what you may about the scale of our modern farms, we need bridging technologies like this to enable mainstream agriculture to transition to agroecological methods. We need to do this at scale if we are to turn soil carbon emissions from industrial farming into stable soil carbon. Biofertiliser is a biologically active fertilizer concentrate, providing a wide range of microbiology, mostly as spores, and solution rich in proteins, enzymes and vitamins formed during the fermentation process. The solution can be fortified with minerals either generally through the addition of rock dust, or specifically through the addition of mineral salts. Biofertiliser is made by breeding up microbes in solution under anaerobic conditions. Cow dung or native microbes from the forest floor form the source of biology for the brew. Into this we add molasses as an energy source, milk or whey to ‘steer’ the brew towards a lactic fermentation, water as a carrier and finally the ferment is enhanced with minerals as the ferment matures. Like most ferments such as yoghurt or cider, this process can be as simple or as complicated as you want it to be. The basic principle is easy, and the modifications to make ferments that suit your soil, crop or livestock may take a lifetime to perfect! The tools are cheap – for a garden you need a demijohn with an airlock, or for larger scale you need a 200 litre plastic barrel with a home made airlock. Biofertiliser is diluted down at the point of spraying onto the crop between 10 and 5%, so a demijohn of biofertiliser will do 4 litres x 10% dilution = 40 litres. I can spray my veggie patch with 2 litres and a hand sprayer, so the one demi john will do me 20 applications or most of the summer at 1-2 week intervals between sprays. But what about anaerobic environments producing pathogens such as E coli? Our early compost tea days taught us oxygenated/good, anaerobic/bad, surely we would be breeding the bad guys in our ferment? Its true there are possibilities for anaerobic ferments to go wrong, but they usually make quite a statement – like putrid aroma or vivid colouring. But the trick with getting healthy ferments is to source clean, fresh ingredients, and to create the right environment for beneficial microbes such as bacillus subtilis and lactobacillus to thrive. These are aggressive beneficial microbes that devour food sources common with the E coli. There are simple tricks for controlling this, not least our own sense of smell that intuitively knows the different aroma of a loaf of bread or fresh yogurt from rotting food. We may worry about anaerobic and aerobic microbes, but in reality most bacteria are facultative, meaning they can thrive in both anaerobic and aerobic environments, E coli being a prime example. The trick is to maintain and environment, whether it is aerobic or anaerobic that favours beneficial microbes. So essentially we have built a cow’s rumen out of a plastic barrel. Its less beautiful, but nevertheless contains a myriad of different biological transactions as the ferment proceeds of which two are particularly wondrous - chelation and sporulation. Chelation has its roots in the word Chela, meaning claw or pincer in Latin. In terms of biochemistry it is the process whereby the electrical bonds holding minerals in an unavailable state are changed through a series of biological or inorganic reactions. The mineral is now held ‘loosely’ often between two hydrocarbon rings and therefore more available to pair at a molecular level, making their way into the biological food chain. Our anaerobic ferment, or biofertiliser, like the anaerobic regions deep down where soil meets bedrock, is particularly suited to this process. Geology meeting biology, producing a range of minerals to plug Liebigs leaky barrel. Our next wonder is sporulation! The basic principle is that when a particular microbe experiences a benign environment, it reproduces at a spectacular rate, but when the environment becomes more hostile it copes by forming spores that are dormant. When times are good again the spores, a minute parcel of DNA holding the key to life, will wake from their sleep and reproduce once more. This is how soil biology can cling onto life under a glacier for 100,000 years only to come to life again in the meltwaters. So our biofertiliser has a wide range of spores ready to awaken when they find themselves sprayed onto soil or plant. Most of them are adapted to both anaerobic and aerobic conditions. They also have a range of minerals that have chelated in the ferment. Another ingredient they have within the biofertiliser is the ‘waste’ solution left behind as microbes contract down into their spore form. This solution is rich in enzymes, amino acids and minerals - a potent fertilizer in its own right. The commercial biofertiliser market is expanding rapidly, with many distributors now joining the market. You can buy Rhizobium for seed coating, Azotobacter for Nitrogen fixing as well as a host of other combinations of products that have been ‘selected’ and ‘screened’ to provide a consistent product. The issue is not whether or not this technology works, it is more how can we adapt it so that it serves small farmers, and does not become yet another agricultural input that we rely on. The fight to keep the true knowledge of agriculture in the hands of small farmers has many champions – one of these is Jairo Restrepo, a Columbian Scientist who has worked in the informal sector for decades teaching and demonstrating the benefits of biofertilisers. His work is to give farmers confidence to make their own ferments, which he argues are as good if not better than commercial products. He gives recipes for preparations in his excellent book The ABC of Organic Agriculture, but he also urges farmers to learn the science behind these recipes so that they keep control of their own destiny. There are vast numbers of farmers in South America making and using biofertiliser on their own farms – some at scale. The conversion to organic agriculture that occurred in Cuba in the 90’s was largely due to adoption of biofertilisers. However, we are not advocating biofertilisers as a silver bullet! They are simply tools that sit alongside good soil care, and plant and animal husbandry. Apart from the ferments themselves, they have bought a new hunger at Ragmans to go back to the science behind our approach to land. We find ourselves thumbing through soil chemistry textbooks! So this is a plea - we need to up our game as organic growers. We need to reclaim the scientific knowledge of the eighteenth and nineteenth century agricultural pharmacists and stand it alongside the holistic knowledge of biologically active soils, that we have developed over the last thirty years. We need to bring this approach back to agricultural colleges on our own terms and develop the science behind this new modern agriculture in a way that puts farmers back in the role of innovators rather than operatives following spray regimes from an ever more directive agricultural supply industry. For those interested in learning more about Biofertilisers please have a look at our website. We often have one day courses, taught by Juanfran Lopez, and a 3 day course being taught by Jairo Restrepo in May 2019. Thanks for reading this far! The photo below is of Matt, Jairo, Juanfran and Carlos, deep in serious discussion about soil biology, social democracy and Tequila.